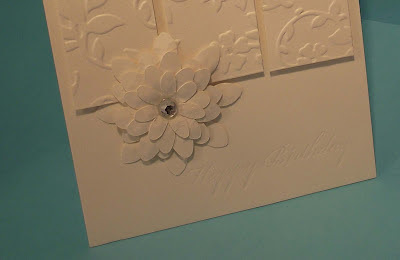 Today I am posting the DT card I made for the White-on-White challenge now running over at Cards Galore challenge blog. This a great exercise in using just white and my research into this highlighted just how crative you can be with one colour. This is my white-on-white card. This is white, trust me, and I thought I should photograph it against a colour to show the card better but nnfortunately the lightening wasn't the best for this project. This card was made with a standard A6 card base with the fold at the top. I 'debossed' the sentiement 'Happy Birthday' using my Quickutz Letterpress polymer die. This is great for a deep impression and I also use the dies with spceial tacky inks for a very professional look. 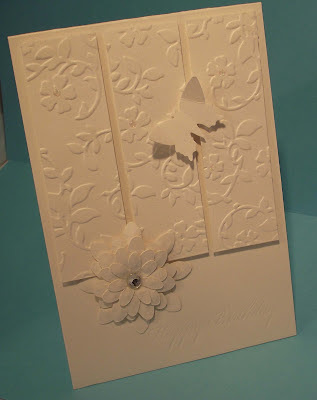 I embossed a piece of the same card with a flower motif and cut it into three panels and adhered them to the front of the card. I used EK Success punches to make the flower and a Matha Stewart punch for the butterfly. Please pop along to the Cards Galore Challange Blog to see the wonderful creations from the DT. The White-onWhite challenge is well worth having a go and there's prizes too! Thanks for stopping by to read my blog Please don't forget to leave a comment, I love hearing from you. Beautiful use of small pieces! I love making cards from scraps I have laying around!